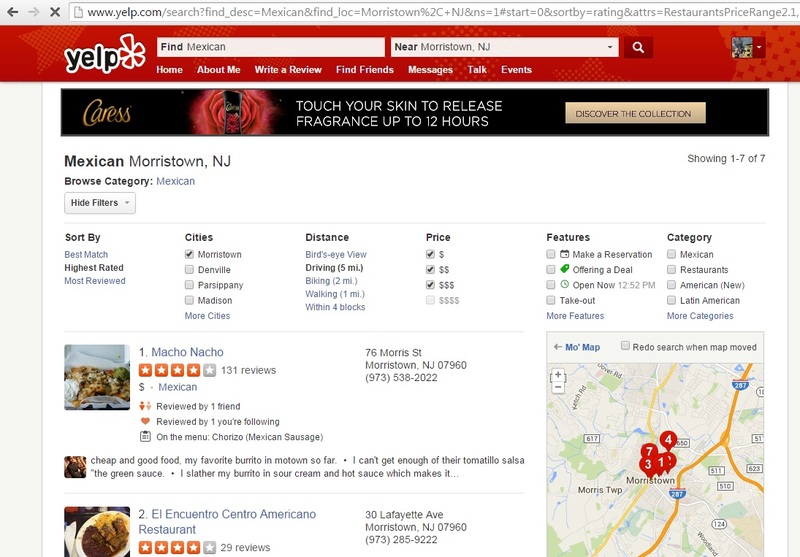 Like many people, I tend to use Yelp whenever I am looking for a restaurant nearby. I mean, no one really wants to go out to dinner and have a bad experience, so why not see what other people are saying. 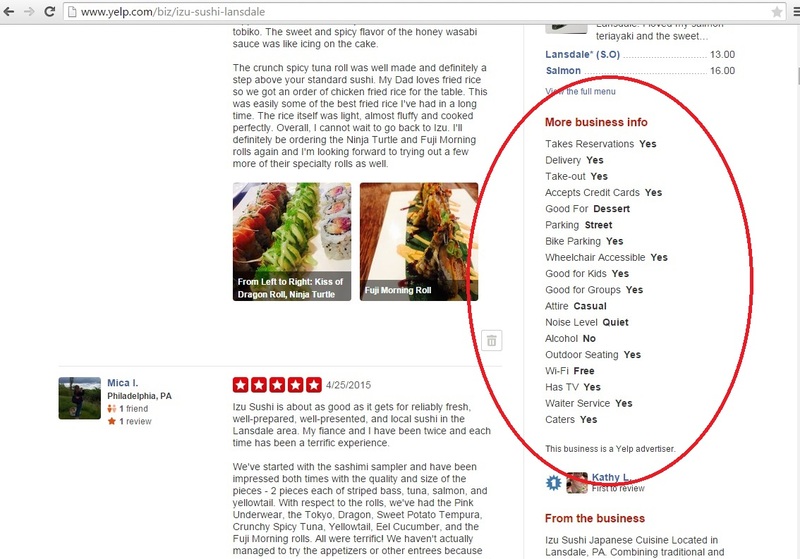 While you can use Yelp to determine where to eat just by looking at the ratings, it has way more than that to offer. Once you’ve narrowed your search by location, food/meal type, price, and rating, there are few great tricks to really make sure you are picking the best restaurant for you. The first thing to do is check out the side bar where they have information about the restaurant. This section will tell you all the key pieces of information you need to know such as are they good for groups, take reservations, take credit cards, serve alcohol, etc. You can also search with a lot of these filters right off the bat to narrow your search. Now that you’ve cut the list down a bit, it’s time to start reading reviews. A great place to start is the highlights. 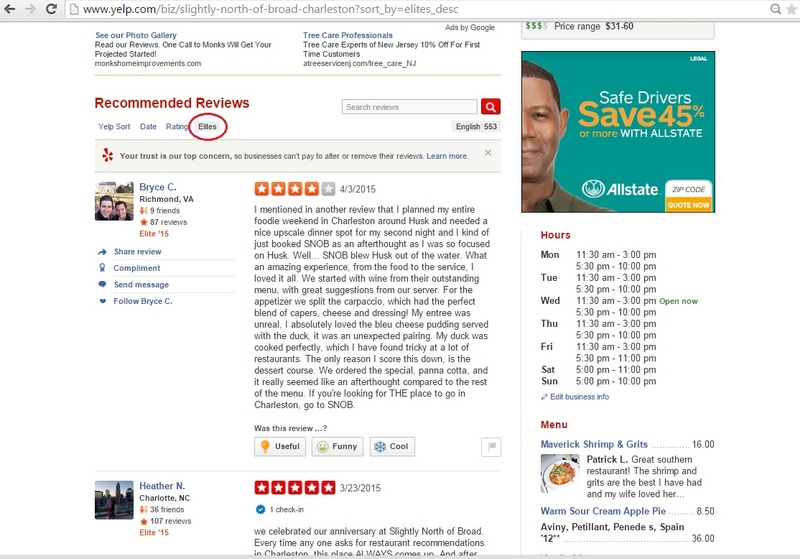 The highlight section shows what key words have been referenced in multiple reviews. While we were in Charleston, we used this section a ton to help us decide what dishes to pick. It led to some amazing meals that we probably wouldn’t have picked if we had just ordered off the menu. I mean, if 30 people are all saying the chocolate pudding is to die for, then it must be pretty good. The highlights might also point out that they have great happy hour specials or if it’s a restaurant that doesn’t take reservations, then they might tell you when you should arrive to get seats. After you’ve checked out the highlights, it’s time to read through some of the reviews. I try to read a few that rated it highly (4-5 stars), as well, as some of the bad reviews (1-2 stars). A lot of times bad reviews are isolated instances, or they are written by people who shouldn’t have picked that restaurant. If you don’t like fish in any form, you probably aren’t going to have a great experience at a sushi restaurant. 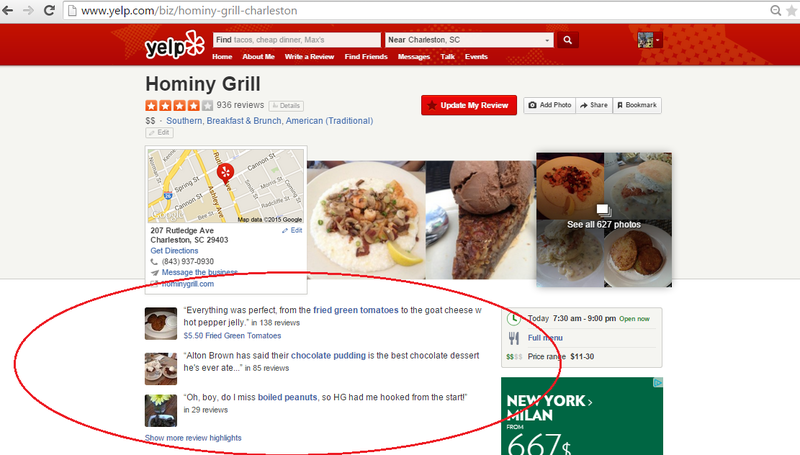 While all reviews can be useful, I tend to look for reviews written by Elite Yelpers. In order to become Elite, you not only need to have a lot of reviews, people also need to find them useful. Since membership in Elite only lasts a year, Elite members are always reviewing places so that they can keep their status, especially since being Elite comes with a lot of great perks like invites to Yelp Elite events at least once a month. Needless to say, I’m still waiting for my invite, but hopefully I’ll earn it one of these days! So now that you’ve filtered correctly, checked out the business info, highlights, and reviews, you think you’re all done, right? Well, not quite. The last thing I would recommend doing to really make sure you’re not only picking the right restaurant, but also the right dishes, is to check out the pictures. While you have to take into account that most photos are taken by amateurs, you can still get a good feel for the vibe of the restaurant, portion size, and food in general. 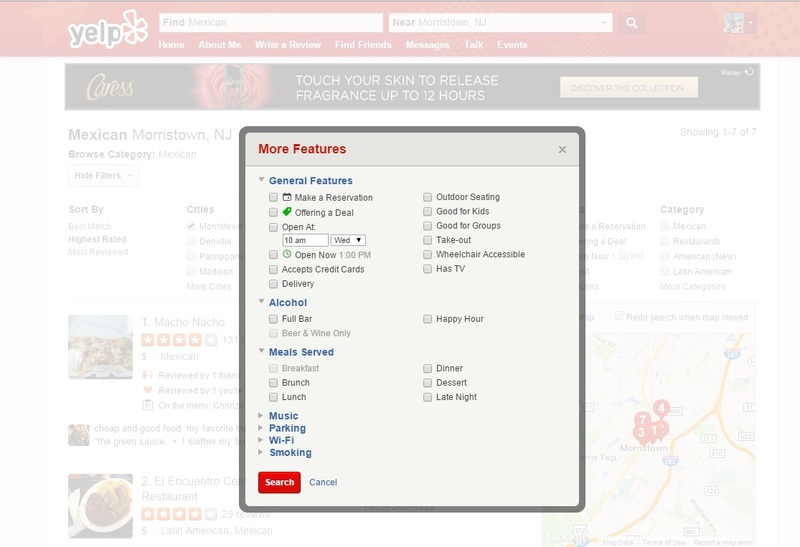 Also, Yelp users may have voted pictures helpful or unhelpful which should give you an idea of which ones to focus on. It may help you to realize that maybe this place is a bit fancier than you were going for, or maybe someone in your group is a vegetarian and all the vegetarian options look sad and boring compared to the meat options. No matter what, the more information you’re armed with when making a decision, the more likely you are to have a memorable dining experience. I know for us we are still talking about some of the food that Yelp helped us find, like the shrimp & grits and chocolate pudding from Hominy Grill, the Sour Cream Apple Pie from S.N.O.B, and the calamari fries from Craftsmen Kitchen & Taphouse. 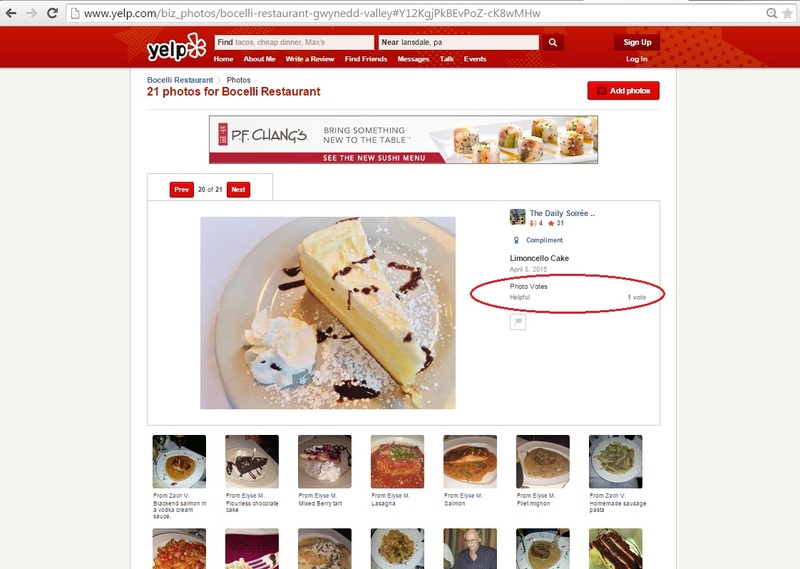 Are you an avid Yelp user? Are there any helpful hints & tips you think we missed?